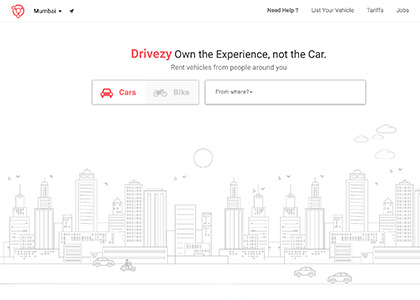 Drivezy is India's first aggregator service in the business of car rentals. Their mission is to transform the way cars are purchased, rented and sold. With Drivezy, you can hire a car anytime and that will be delivered right at your doorstep. It delivers rent-a-car services in Mumbai, Bangalore, Pune, Gurgaon & Noida. All you have to do is select the location, timings and book your favorite car to enjoy the ride. Find the promo codes present on this Happy Sale page that can help you save on your car rental bookings. Spend smart and save smart! Offer valid only on Wednesdays.Hurry up and avail now! Verified on 20/4/2019 . Get flat 50% off + 50% cashback on bike bookings. Applicable in mumbai, pune, bengaluru, mysuru cities with minium booking of 24 hrs. Apply coupon code at check out page before booking to get this offer. Valid for all applicable city users. Verified on 20/4/2019 . Drivezy is offering flat 10% discount for mumbai users. Use this Drivezy Mumbai promo code while booking a car for rent to get discount. Coupon is valid on Scorpio bookings only. Applicable for both old and new Users. Now book and save your money on your car rentals. Book it today! Verified on 20/4/2019 .. Get 3 hours free ride for new users on your first booking on weekends, on weekdays get for a min booking of 5 hours. Valid for Amaze & Ritz bookings only. Apply above coupon code with out a miss to get this offer. Rent today. Verified on 20/4/2019 . Drivezy provides all categories of cars on rent and self drive. It allows renting a car for self drive in Mumbai, Bangalore, Pune, cities. Use this coupon code for Drivezy car rentals while booking for scorpio car and get flat 10% discount. Use the given discount coupon code at check out page to reduce your budget. Happy saving, happy riding from Drivezy! Book now. Verified on 20/4/2019 . Get flat 20% off on Hyundai Xcent car rental bookings. You can avail this offer in pune, mumbai and bangalore cities. Apply coupon code at check out page to get discount. Book your rental car now. Verified on 20/4/2019 . Get flat 20% off on Nissan Sunny self drive car rental bookings online. You can avail this offer in Pune, Mumbai and Bangalore cities. Apply coupon code at check out page to get discount. Book your rental car now. Verified on 20/4/2019 . Get flat 20% off on Tata Zest car rental bookings. You can avail this offer in pune, mumbai, mysuru and bangalore cities. Apply coupon code at check out page to get discount on your car rental booking. Book now. Verified on 20/4/2019 .. Get flat 10% off on scorpio bookings for Mumbai Users. Apply this coupon at check out page to get flat 10% discount. This is valid for Mumbai Users only. Book now! Verified on 20/4/2019 .. Now book Hondacity cars for rent with Drivezy at reduced fare. Here you get 10% discount on your online booking by applying this coupon code. For Hondacity hourly fare starts from Rs 89/km on weekdays and Rs 129/km on weekends. Book this five seater here and get 10% discount using this discount coupon. Get a ride today with just ride. Verified on 20/4/2019 . Drivezy provides amazing discount on Honda city self drive car rentals. Use the given coupon code to get this 10% discount. For more details click show coupon code and check landing page. Offer applicable for ALL Pune users only. Book your rental car now. Drivezy the fastly growing self drive car provider brings a never before tariffs for car rental plans. Use this Drivezy Bangalore coupon and get a three hour ride free. This is applicable for new users only. This coupon is valid on weekdays for a minimum booking of five hours for Amaze and Ritz only. Valid for Bangalore Just Ride new users only. Rent a Drivezy car now. Verified on 20/4/2019 . Now car rentals in Pune can done easily using Drivezy online portal. Here you can select car types like Mahindra Scorpio, Honda Amaze, Mahindra XUV, Honda City, Maruti Ritz etc,. In self drive car rental, you can choose with fuel or without fuel. Select according to your requirement and book now. No Promo code is required. Renting a self drive which is so affordable and simpler with Drivezy. Hire a car in Mumbai for self drive in 3 steps and have a safe ride. Use mobile app or visit their website to rent a car. Pay via your preferred mode of payment. Drive your car and explore amazing ways to travel. Fuel and insurance is on us. Verified on 20/4/2019 . With Drivezy, Get best rental prices on luxury, economy, and family rental cars. Get best price on Mahindra Scorpio bookings with Drivezy. For Scorpio hourly fare is Rs 130 on weekdays, Rs 180 on weekends. Click activate offer get more terms and conditions. Start booking and Enjoy ride at reasonable fare. No coupon code required. Book Drivezy today. Verified on 20/4/2019 . Drivezy presents best price on everyone's favorite Honda Amaze at just Rs 90 per hour. Visit Drivezy self-drive a popular car rental online website and book your favorite car at mentioned locations in the landing page. Choose from cars like Maruti Ritz, Mahindra Scorpio, Mahindra XUV, Honda Amaze, Honda City & More. No coupon code required to get this deal. Book now. Verified on 20/4/2019 . Drivezy car rental services now available in Mysuru city. Rent a self drive car and the enjoy the city. No coupon code is required to avail this offer. Check more details at merchant website. Rent your car now. Drivezy car rental services now available in Mumbai. Rent a self drive car for self drive in 3 steps. Click here to get hassle free car rental bookings with Drivezy for Mumbai users. Check more details at landing page and book now! 1. Booking via mobile app/website. 2. Home pickup available for most locations. 3. Maximum liability in case of accident only Rs 3000. 4. Security deposit of only Rs 999. 5. Extend your ride as required. 6. Dual airbags and ABS in all cars. Click activate offer to enjoy these benefits while booking a car online without using any promo code. Book today. 1. Your maximum liability in case of damages is Rs 3000. 2. Rent cars starting at Rs 4000 per week. 3. Home Delivery or Pick from Station. 4. Share the car and the rental with your friends and loved ones. 6. Fuel Less (They will provide full tank and same is expected while return of the car). Book your car rental today. 1. Minimum three completed bookings. 2. Minimum 72 hours of booking. 3. No damages on any booking. Check more details in the landing page. No coupon code is required to avail this offer. Rent your car today. Verified on 20/4/2019 . Avail Easy Cancellation and refund policies with Drivezy car rental service. 1. A booking can be cancelled by the user through the Drivezy mobile application or website. Alternatively, the user may also contact the customer care and request a cancellation. 2.In case of cancellations prior to 24 hours of pickup time, user will be charged 5% of the total transaction amount subject to a maximum of Rs 2000. The refund will be credited to the user's account in 7-9 working days. 3. For cancellations made within 24 hours of pick-up time, user will be charged 15% of the transaction amount subject to a maximum of Rs 2000. The refund will be credited to the user's account in 7-9 working days. 4. In case a user fails to show up for his reservation or cancels the ride 2 hours before the pickup time, the booking shall be treated as a No Show and only the security deposit shall be reimbursed. Check more details in the landing page. Click activate offer Rent your car today. Verified on 20/4/2019 . With Drivezy, get best price on Scorpio self drive car rental bookings. Book here and get pocket friendly fare. Check more details at merchant website. No coupon code required to get this car rental offer. Book now. Verified on 20/4/2019 .. With Drivezy, get best price on Honda Amaze self drive car rental bookings. For Honda amaze hourly charge is Rs 105 on weekdays, Rs 135 on weekends. Book here with Happysale deals and get best price on car rentals. Book here and get pocket friendly fare. Book just ride today. Verified on 20/4/2019 . All Drivezy cars are licensed for Self Drive and have an All India Permit, so you have the freedom to drive and explore the entire country. The cars have a commercial license, so make sure you obtain a visitor's permit when crossing over to a different state. To make your journey hassle free, Drivezy gives a complete reimbursement for visitor's permit issued by a few selected states. The charges incurred shall be refund to you along with your security deposit. Enjoy your hassle free rides to other states here. Visit website and check more details. Verified on 20/4/2019 . Book affordable and awesome bikes online for rentals at Drivezy and get up to 65% discount. Starting at Rs 7/hr and Rs 1500/7days. No hidden charges and no coupon code required. Valid for Bangalore users only. Book your rental bike now and get discount. Are you looking for Just ride first ride coupon ? Click here to get it now. Apply this coupon while booking a car and get a three hour ride free on a minimum booking of 5 hours. This coupon code is valid on weekdays and on Amaze & Ritz only. Book now. Justrides presents three hours free ride. Apply this Justride first ride coupon while booking a car to get free ride. This coupon is valid for new users. Valid on weekdays for a minimum booking of 5 hours for Amaze & Ritz only. Valid for Mumbai Users. Ride now. Drivezy is giving Flat 10% OFF on booking Honda City Car rental services. You can avail this discount in all the cities that Drivezy operates namely Mumbai, Bangalore, NCR and Pune. Apply the mentioned coupon code while booking to avail this incredible limited period discount. Valid only on Honda City bookings. Click here to book now. Get flat 20% off on all car rental bookings made till 6pm. Applicable in mumbai, bengaluru, pune cities. Apply coupon code at check out page to get discount. Get flat 50% off for all rides ending until 23rd Feb, 12:00 am for min booking of 12 hours. Applicable in mumbai, pune, bengaluru cities. Apply coupon code at check out page before booking to get this offer. Get flat 30% off on all car rental bookings. Applicable on min 18 hr bookings till Friday 21st, 6 PM. Apply coupon code at check out page to get discount. Drivezy brought a revolution in renting private cars for personal use. Mainly operated in cosmo cities like Pune, Mumbai, Bangalore and Delhi, just ride's concept of car rentals transformed the mode of fundamental transportation. With their mantra of “Why buy a car, when you can rent one?”, Drivezy is expanding their area of services within the country. They offer just ride first ride free coupons for more beneficial bargains. For a week long getaway, you don’t need to opt for congested transport options. Go out and enjoy your personal holiday in your personal transit. No more surges and queues. Renting a car with Drivezy is simple with no intricacies. Just plan your ride ahead and book a cab from just ride to enjoy a pleasant trip overall. With Drivezy, you don’t need to buy a car for a joyous ride, you just need to rent. Save your rental charges with just ride coupon codes. Rent a car in cosmo cities within budget tags with Drivezy bangalore coupons. Because renting a car is effortless. You can invest your money on your trip rather on the set of wheels. Now, no more ideal waiting. With Drivezy, you can rent a cab when needed. Luxury range of wheels for your lavish holidays. Choose your range of car for your holiday. To the doorstep. Get your car delivered to your doorstep at preferable time slot. We are there where savings are made. Ride on your private car economically through Drivezy promo codes. Through happy sale, you will never miss a deal on car rentals. We offer you a budget-friendly ride in metros too. Use our just ride first ride coupon and book a self ride car within the wallet range. Why put money when you can get a ride for free? Enjoy just ride referral codes for many exciting deals on the car rentals.